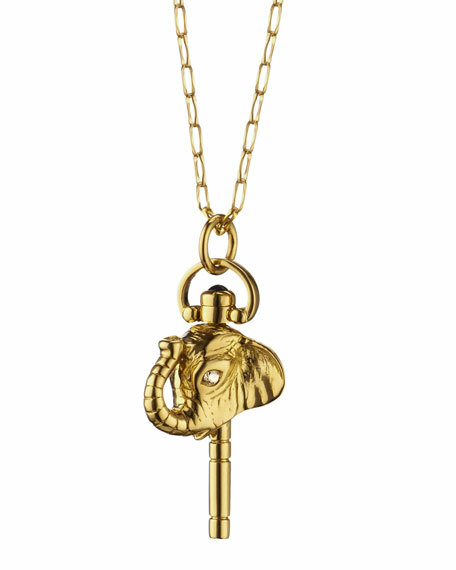 Monica Rich Kosann Luck key necklace. Approx. 1.2" drop and 0.6"W.
Monica Rich Kosann's collection of 18-karat gold and sterling silver lockets, charm bracelets, and other fine jewelry is rooted in the idea that every woman has a story to tell. Monica's began her career as a fine art portrait photographer using black & white film and darkroom techniques that are wholly unique in our digital age. The personal nature and heirloom quality of her portraits informed her interest in jewelry design. For Monica, the jewelry design process is driven by one question: "Can a woman give this piece of jewelry to her daughter in 20 years?" Monica says, "I hope that my collection creates heirlooms for our generation while maintaining an enduring sense of fashion and timeless style. Living and cherishing stories is universal to us all. 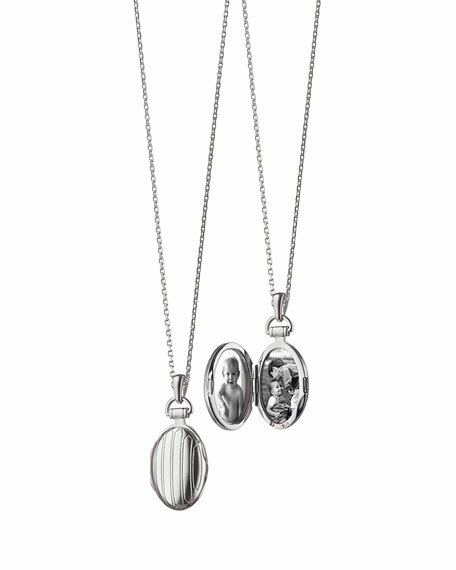 A locket depicts a moment unique to the wearer. A charm bracelet celebrates the story of that woman's lifein a way, it is like a fingerprint, totally unique to the wearer." 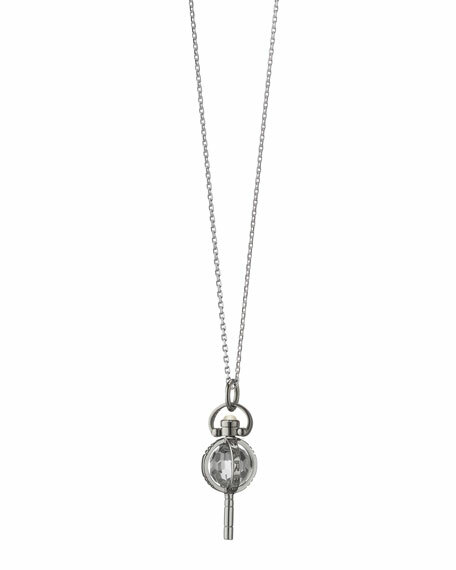 Like her lockets and charm designs, all of Monica's collectionsbe they Pocketwatch Keys, Planets or Poesy Ringsfuse a timeless heritage of design with a contemporary and modern sensibility. Monica is a member of the CFDA (Council of Fashion Designers of America). For in-store inquiries, use sku #43578. Monica Rich Kosann locket necklace. Solid sterling silver. 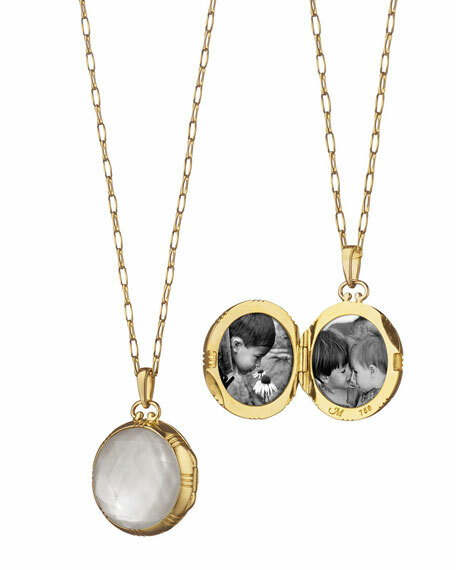 Locket opens to display two oval photos. Front of locket features pinstriped texture. Chain necklace, approximately 30"L. Pendant, approximately 0.8"L x 0.5"W. Lobster clasp. Imported. 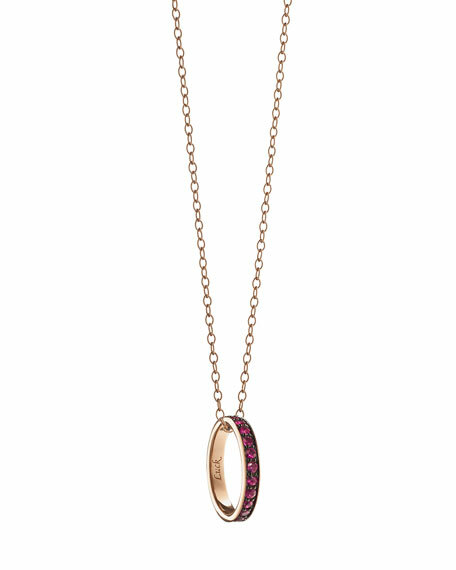 Monica Rich Kosann petite locket necklace. 18-karat gold with rock crystal over mother-of-pearl. Locket opens to display two round photos. Delicate oval link chain, 30"L. Pendant, approx. 0.8"L. Lobster clasp. Imported. Monica Rich Kosann pendant necklace. Solid sterling silver. Pocketwatch key detailed with moonstone cabochon and carved with "CARPE DIEM" lettering. Intensely faceted rock crystal. Chain necklace, approx. 17"L. Lobster clasp. Imported.